I am a writer and consultant with a passion for food, health and stories about real people. Follow my blog on www.fresh-creative.com.au. This festive season serve your friends and family the best seasonal produce available. Buying local means that you not only feel good about supporting WA's growers, but you also get the freshest, best quality produce that you can find. In my house I do the food shopping and, being the nerd that I am, I spend a lot of time hunting for the best value and quality available. Lucky for you I have compiled a list of my favourite places to buy from so you can save time and get shopping! 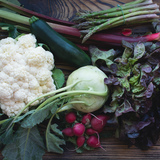 There are more and more online options for buying local and organic produce. Get in quick though to get delivery before Christmas as last orders will be filling up! Farmers' Markets in Perth have continued to go from strength to strength. It is such a wonderful community activity to engage in while getting to know where your produce comes from and enjoying some time outdoors. Do yourself a favour and make it a weekly ritual. My regular produce is primarily purchased from the Stirling Farmers Market on Cedric Street each Sunday morning. There is an ever-expanding range of meat, seafood, ready-meals, snacks, fruit and veg, drinks, plants and other products to buy, as well as live music and a raffle to support the Rotary Club of Karrinyup. Don't forget to grab some raw sauerkraut from Green Street Kitchen!! For a full list of WA's Farmers Markets go to The Australian Farmers' Market Association directory here. My household consumes loads of fruit and veg each week so its no surprise that we need top-ups from the shops when the fridge starts to look a bit bare. My pick of the bunch are listed. Various locations - always a great selection of local produce that is well labelled. I have found great produce in the Subiaco, North Beach and Woodlands stores. So there you go. No excuses to doing the right thing and making a fresh, seasonal and best of all locally-grown feast this year! Please leave a message if you have an amazing store you think I should add to the list. I would love to hear from you and discover more fresh food! Ooo don't forget the Little Big Store! It's a newly opened Organics store at the Wanneroo Markets, 33 Prindiville Drive Wangara. Open 9am to 5pm Friday to Sunday, some of our fresh veg even comes straight from the farm in Muchea. We have 10% off this weekend, the 19th Dec 2014.